The dog days of summer see thriving warm season crops-tomatoes, zucchinis, cucumbers, eggplant, green beans, sweet potatoes, peppers and Mediterranean herbs. 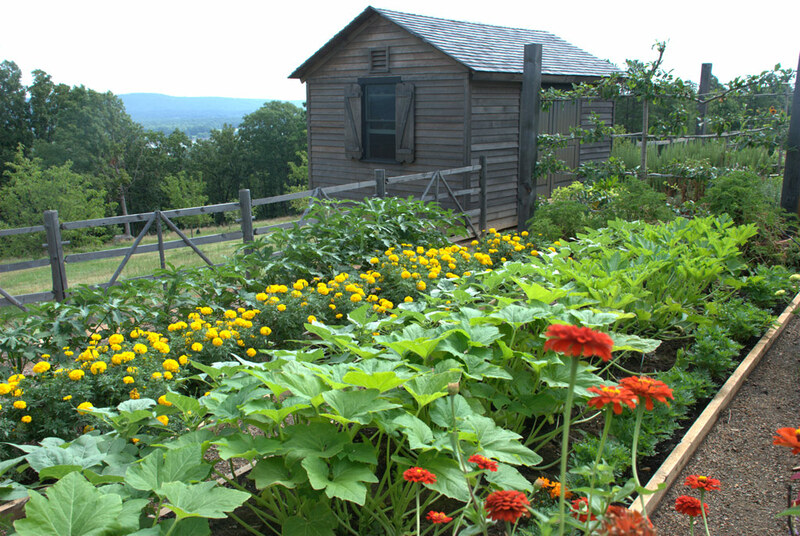 To keep your harvests at their peak, there are few simple things you can do for your garden. 1. Harvest frequently! Plants are in the business of reproducing. Their entire life is dedicated to giving the best chance possible of maintaining more plants for the future. The more you harvest, the more babies the plant will produce. I have noticed that my cucumber plant can only support one large cucumber on each vine. As soon as I pick the big one, you can see one of the small ones jump in size by the very next day! Harvest in the morning for peak juiciness. 2. Mulch your beds. The mulch keeps the moisture from evaporating, allowing more infrequent watering. It also moderates the temperature of the soil so it doesn’t get baking hot. I use mulch in both my garden beds and pots. 3. Water consistently. The cause of cracked fruits is inconsistent water. The plant gets used to very little water and when deluged the fruit’s skin can’t expand fast enough and the fruit cracks. Over watering can also be a problem. Too much water will cause your fruits to be tasteless and mushy. If in the ground, your plants need either a good soaking rain each week or a good watering. I use soaker hoses in my mulched garden beds. Do not water the foliage of your nightshade plants! They are very susceptible to fungal diseases and water on their leaves encourages fungal growth. It is best to water in the morning; you get maximum absorption biggest bang for your water buck. For pots, you will likely need to water 3 times per week during the height of summer heat. I like pots with a water reservoir built in the bottom. 4. Fertilize monthly with side dressing of compost. It is also a good idea to add minerals to the soil. You can purchase minerals just for gardening. You can also use kelp or seaweed as a fertilizer that also adds other nutrients. If your plants have more minerals, their fruits will, too! Read the full story via Organic Gardening Blog – MOTHER EARTH NEWS – Growing Organic Food, Vegetable Gardening, Organic Pest and Weed Control. ⇐ Will organic farming save Lehigh Valley farmers?